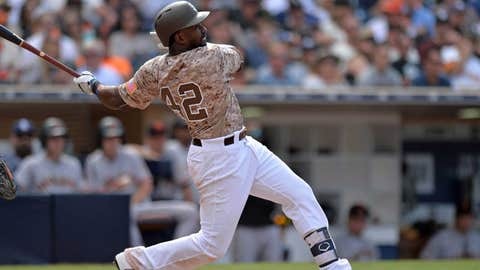 SAN DIEGO — There aren’t any firsts happening at Petco Park on Monday when the Los Angeles Dodgers and the San Diego Padres open a three-game series. But there are a couple of things going on that haven’t happened in so long that they qualify as near firsts. And Monday will mark the first time since 2013 that the Padres and Dodgers haven’t met on the Opening Day. Those matchups didn’t go very well for the Padres. The all-left-handed opening matchup of the series will be Erlin coming out of the bullpen to make a spot start against the Dodgers’ Hyun-Jin Ryu, who has a 1-0 record with a 2.79 ERA in his first two starts this year. Opposing hitters are batting only .176 against Ryu, who allowed six hits while issuing six walks in 9 2/3 innings. Erlin, 27, will be filling the spot in the Padres’ rotation left open while right-hander Luis Perdomo serves a five-day suspension for throwing behind Nolan Arenado last Wednesday afternoon and triggering a brawl at Coors Field in Colorado. Although Erlin hasn’t pitched against the Dodgers since 2015, he has had some success. He is 1-1 lifetime against Los Angeles with a 1.17 ERA in three games (two starts). Ryu last pitched on April 10 against Oakland at Dodger Stadium, where he gave up one hit in six scoreless innings, picking up the win in the Dodgers’ 4-0 victory. He struck out eight against one walk on 90 pitches.